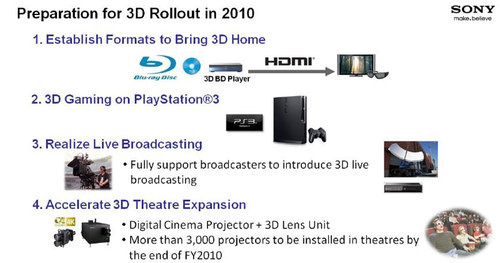 In a presentation detailing Sony's plans to become profitable by the end of 2010, Sony revealed plans to upgrade Playstation 3 consoles with full 3D support. 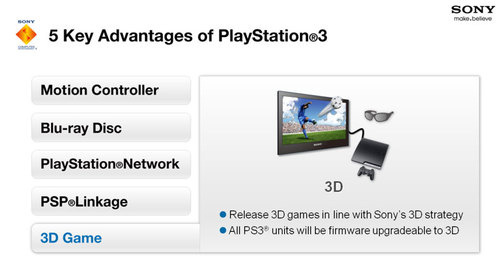 The news supports previous reports on Sony's 3D PlayStation 3 strategy, suggesting that a firmware upgrade would introduce the capability to existing consoles. Not only does Sony plan on upgrading the console to support 3D, but release games in 3D as well in order to take advantage of the enhanced capabilities. Of course, 3D games and 3D televisions would go hand-in-hand, so adding the capability to the PlayStation 3 would definitely help drive at least a few television sales.